The Kuykenstrong Foundation will be partnering with American University and Nike for the Eagles’ 2014 Alumni Day on October 4th. American takes on Holy Cross at 1:00 P.M. at Reeves Field. 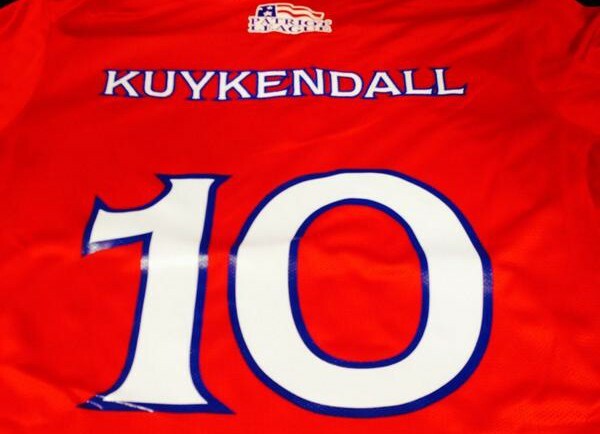 Following the match, the Eagles will be auctioning off the commemorative game worn jerseys of each player with the proceeds going to benefit Kuykenstrong and American University. Detail from the back of the Oct. 4th commemorative jerseys. To participate in the bidding process, which is currently underway, click here. This marks the second fundraising event held by Kuykenstrong this fall. The inaugural Kuykenstrong D.C. College Cup was also at Reeves Field in late August.